Uttar Pradesh ranks third in GDP among Indian states, and is positioned at the 7×3 slot within the G8x8. In 2015, Uttar Pradesh contributed a GDP of 163.7 billion USD, which was 8.4% of the total of India. It was almost as high as the national GDP of Qatar, Algeria, or New Zealand. More than 100 people died in dust storms and lightning strikes in parts of Uttar Pradesh and Rajasthan in the first days of May 2018. More parts of India will witness thundershowers accompanied by gusty winds, the India Meteorological Department (IMD) warned. Weather analysts said there is a fair amount of moisture incursion from the Bay of Bengal and from North India, which will lead to the formation of storm clouds and widespread thundershowers across East India, Gangetic plains, southern India and Central India. Ten people were killed as heavy rains lashed Telangana and Andhra Pradesh on Thursday, officials said. While five people were killed in various rain-related incidents in Telangana, an equal number of deaths were reported from Andhra Pradesh. Delhi on the other hand may see strong surface winds during the day time towards Sunday, the IMD said. Delhi, that saw 14.4 mm rainfall over past 24 hours, recorded a mximum temperature of 35.2 degrees on Thursday, three notches below the season’s average. The minimum temperature was recorded at 19.8 degrees, five notches below the season’s average. Rajasthan, which that saw at least 31 dead, with causalities reported from Alwar, Dholpur and Bharatpur districts,may see another spell of duststorm and rains over next few days. 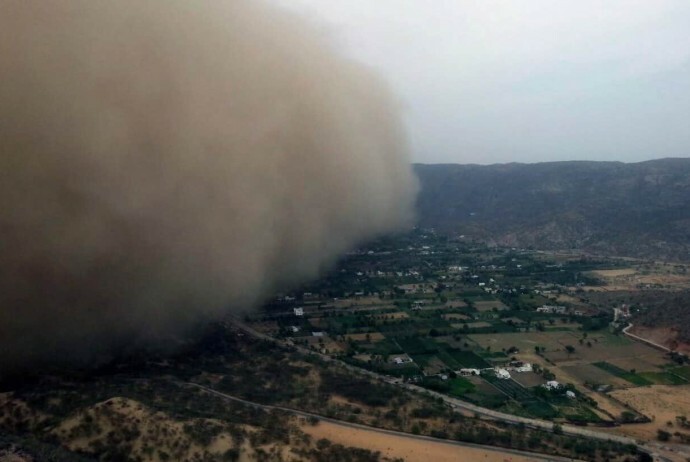 The regional weather office in Jaipur had issued a warning for dust storm, light rain and thunderstorm for Alwar, Banswara, Bharatpur, Dholpur, Dausa and Bhilwara.